146, 123 p. : ill., ports. ; 24 cm. Originally published: Nyu Yorḳ : O. Fg., 1968. 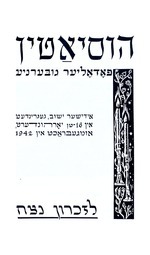 At head of title: David and Sylvia Steiner Yizkor Book Collection.